On 7th June 2012, Mahindra unveiled the upgraded version of the Mahindra Rodeo and recently it officially launched the same in South India. The scooter will definitely come to other regions of India but in a phase wise manner. 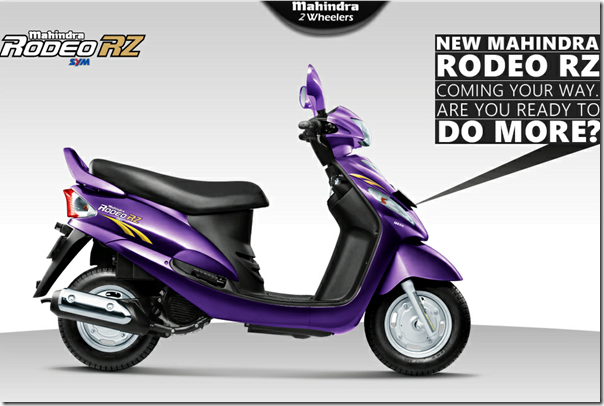 Mahindra 2 Wheelers is planning to sell 5000 units of the Rodeo RZ and will target young urban couples. The upgrade has been done both on the technical level and bodily level. On the technical front, Mahindra has retained the same 125 CC engine but the same now features Dual Curve Digital Ignition System, that improves the engines performance eventually putting out a little more than 8 BHP of max power and 9 Nm of max torque. Interestingly the engine still manages to deliver a ARAI certified fuel efficiency of 59.38 KMPL. The new Rodeo also comes with a host of new body graphics including a 125 CC badge on the front and seven interesting colours including Mystique Violet, Electric Green, Flame Orange, regular white and regular black. The ground clearance of the scooter has been increased by 24 mm as there were several issues reported by customers in the previous model. Even the storage space has been increased to 22 litres. Mahindra two wheelers is all set to launch 3 more motorcycles in India this year including the much anticipated Mojo and two other bikes which are expected to increase sales volumes for Mahindra two wheelers in India. Stay tuned for more updates.